English C1950's. 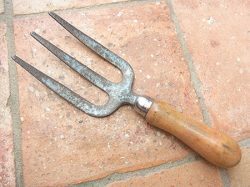 3 Flat tine steel fork stamped 'Jenks & Cattell. Made in England'. Traces original blue paint. Beech handle. 10.5 inches (27cms).